As dozens of low-income Ottawa residents shuffled into a local food bank for a warm meal Tuesday, they were asked to wait quietly, crowded off to the sides of the room until Social Development Minister Jean-Yves Duclos finished using their space to announce the Liberal government's long-promised anti-poverty law. 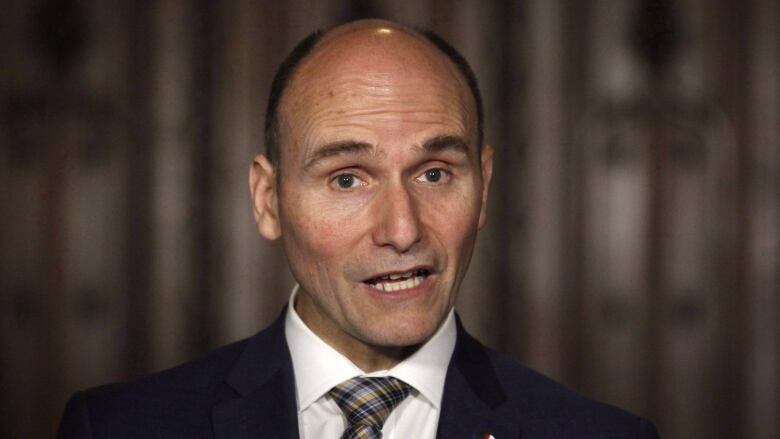 Duclos then stood at a podium to share his government's plans to enshrine into law targets to reduce the rate of poverty in Canada. The law will also establish the country's first official poverty line using the "market basket measure," which tests whether a family's income will mean they can afford a set of basic goods and services — something advocacy groups had pushed for in public consultations leading up to this law that has been two years in the making. It also proposes to create a national advisory council on poverty, which would provide advice to the minister and include a dedicated adviser on children's issues and an annual public report on progress made toward the poverty-reduction targets. "Our vision for Canada is to become a world leader in the eradication of poverty, a vision for a Canada without poverty," Duclos said. "We understand that the road to achieving this ambitious goal will be a long one, and we have a lot of work to do to get there." But the new law does not include any new spending for programs meant to help Canada's poor today. The proposed legislation comes in advance of another promised bill to enshrine the Liberals' national housing strategy in law. Both moves would make it difficult for any future government to back out of the Liberals' plans. Don Flynn, a board member of the Parkdale Food Centre, leaned in close to the podium as Duclos spoke, sometimes letting out an audible "humph." Afterward, he said he didn't hear any tangible steps planned as part of the new law to help the poor and homeless beyond a new measurement tool. "My concern is, without dollars attached to these announcements, in terms of our neighbours here and our clients — how is that really going to change anything for them?" he said. "The amount of income that these people get from Ontario Works and ODSP (Ontario Disability Support Program) hasn't changed significantly for some years ... and I don't see anything here today that will make that much difference," he said, adding he remains hopeful for future investments. Karen Secord, who runs the food bank, said she is also trying to remain positive that concrete measures will soon follow to help Canada's poor and vulnerable. But she let the minister know that platitudes will not go far enough, highlighting new concerns that have been raised over the Ontario government's plan to reform social assistance in the province. "I have hope in the federal government that they will do the right thing, which is why I wanted to host them here. But in the end, I couldn't let (the event) end without speaking on behalf of all of these families living in shelters," she said.